is that what the new one looks like? or is this just a proof of concept by marketpress? @Chris, it's just a concept by MarketPress, hope you like it. MP6 is now available as a plugin, and I've been using it with pleasure for some time. I quit using the Ozh across-the-top menu, because it doesn't work with with the iPad. There don't seem to be any labels for the comment signon form below. I hope I did it right. What a great design!! Anyway, i would remove the "quickpress" block. We all know that, nowadays, it is impossible to write a good article without pay attention to images, style, seo stats and details and so many other things. So, i think it's not useful to have that block within the dashboard. If i'll need to write an article (a great, original and complete article), i will use the proper window. I'm liking the concept design, certainly got the infographic feel to it. Does anyone know a potential release date for 3.7? I believe the rumour release date is for January 2014. Awesome WordPress theme. It looks much better than the MP6, cleaner, more space. I like it. Thank you for the link to marketpress, great read. Cheers! Wow that looks great. I Sure hope we have something that good to look forward to. I've got tired of the current dashboard almost immediately. thanks you very much for great content. Wow - thats an awesome WordPress back-end design. Is there any plugin available? Thanks for sharing nice infographic. Wow folks, that design is slick!!! I am loving it!!! I like the look of this new design, but there aren't too many differences from the current panel. I want to see a better grouping together and reformatting of all the elements for editing and working on a WP site. Too often I'm left wondering "now, where was that bit of content edited again... was it in a sidebar somewhere or another widget or a plugin..."
Nice design , IS this simply a change to look & feel of the backend or there are any functionality addon's? Wow, I wish I had such dashboard folks!!! @Vijay, it is simple a change to look and feel, but as Nick mentioned, it is also recommended to use the dashboard more effectively. So yes, if we would do the backend, we would also do some functionality changes. Great design. I fully agree that the dashboard needs a redesign ... I hardly use it even if it is the first page which comes up when I log in. too cluttered and no info on there at the moment. "The dashboard is the least used and yet most needed page in the back-end. Why?" That is a great question. I know I barely glance at it on my way around the back-end. Just doesn't seem worth a look when I'm often in Analytics. This design is very interesting, though. 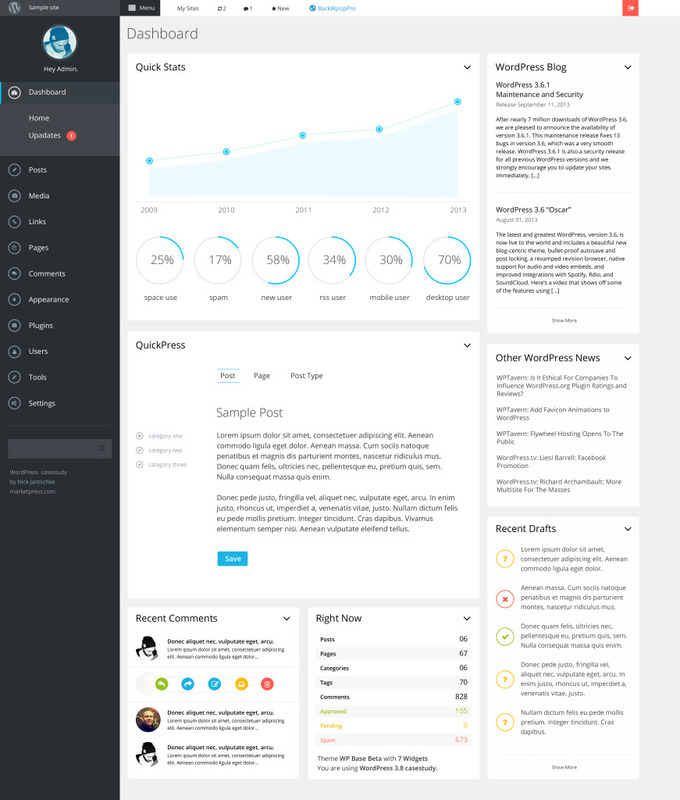 Dashboard does need a Redesign may be just making it little more smooth could do the trick.